The CLOUD, as named by its designers is the result from an extensive collaboration of multi-disciplinary teams for a competition set up by London Mayor Boris Johnson committed to build a tourist attraction in the Olympic Park "with a legacy for the east end [of London]"
The team, comprised of an international team of artists, engineers, and architects included Arup engineers, architecture largely by Carlo Ratti, Walter Nicolino, Atmos, SENSEable City Lab, and landscape architecture by Agence Ter among many others, one being Dan Hill of City of Sound. 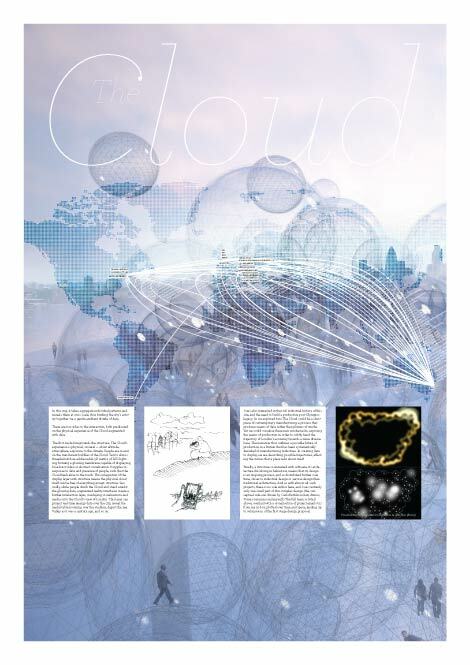 The Cloud, as it is known, and its spheres are intended to be made from from plastic known as Ethylene tetrafluoroethylene (ETFE), the material used to build the Beijing Aquatic Centre. The spheres act as an observation deck, a park, and LCD screens to allow for the digital display of information. Its a work of interactive architecture, more then a space or structural element, but a beacon of real-time digital communication. The CLOUD brings an illusionary story to its citizens and locale, allowing people to feel as architectural participants rather then simply observers. While the mayor is still in the "process of the deciding," the design team plans on reaching out to millions of people for micro-donations to build the project. This is interesting, as I recently spoke to a landscape architect friend about applying micro-finance to building parks. The idea, if parks are for people, why wait for developers to supply the money, through small donations from thousands of potential visitors, we can build what we want (at least, that's the idea). I'm looking forward to seeing the progression of the project and hope it comes to fruition. It could make for an excellent precedent in cross-disciplinary collaboration and citizen development.